Preheat your oven to 375 °F. Rinse and peel the beets. Cut into half inch cubes. Place on a baking sheet and toss in 1 tbsp olive oil and season with salt and pepper. Roast until tender, about 25 to 30 minutes. Rinse and dry the fennel. Cut the dark green stems from the fennel bulb. Pick the feathery fronds from the stems and set the fronds aside to use later. Discard the stems. Cut the fennel bulb from top to bottom, and remove the V-shaped core. Thinly slice the cored bulb and place in a large bowl along with the fronds. Rinse the radishes, trim the ends, and slice into thin rounds. Separate the lettuce leaves from the root, rinse, and dry. Add the radish and lettuce to the bowl with the fennel and fennel fronds. Place a small saucepan over medium-high heat and add the hazelnuts. Shake pan every 30 seconds or so until they’re toasted and golden brown, about 2-3 minutes. Remove from heat. Rinse the blood orange and trim off the top and bottom of the fruit with a knife. Set the fruit on end and slice the peel from the flesh, beginning at the top and following the curve down. Then, over a medium bowl, cut out each segment by inserting the blade of the knife between the flesh and the membrane. Lastly, squeeze the juice from the leftover membrane into the bowl, and set wedges aside. Add the miso paste and maple syrup to the bowl with the blood orange juice. Peel the ginger and grate into the dressing. Add 1 tbsp water, 1 tbsp olive oil, the sesame oil, and a pinch of salt and pepper. Whisk to combine. Add the ginger miso dressing to the bowl with the fennel, radishes, and lettuce, and toss well with a pinch of salt and pepper. 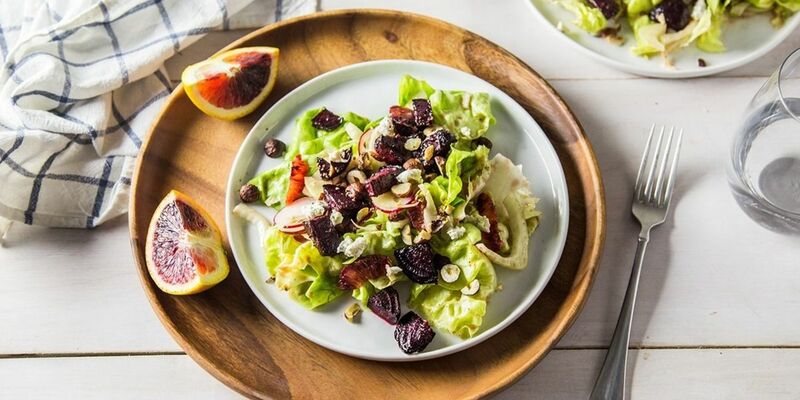 Divide the fennel salad between your plates and top with the blood orange slices, toasted hazelnuts, and crumbled Kite Hill cheese. Drizzle with any remaining dressing left in the bowl and serve!